It’s hard to think of Honda as being “mid-Century”, isn’t it – that seems like such a long time ago now. Mid-century is such a current buzzword and I wouldn’t exactly call this 1953 Honda Dream 3E mid-century modern but it sure is cool, not to mention rare. It can be found here on eBay in Santa Ana, California and it has an unmet opening bid of $9,995. I’m not usually one to relate one vehicle to something else, but this Honda Dream almost has an early BMW look to it, no? 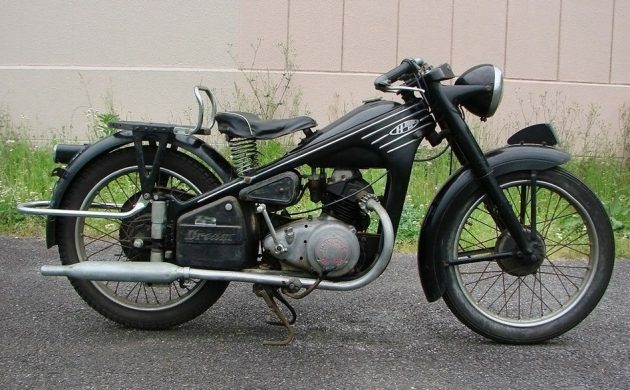 The 3E was the third version of the Honda Dream and needless to say, you would gain instant star status if you showed up at any vintage motorcycle event with this bike. 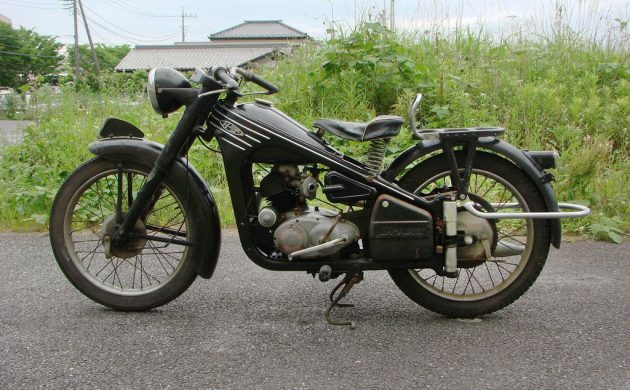 Well, not Sturgis, but any vintage Japanese bike event. This one was “just imported from Japan” according to the seller. It really has a cool, low-slung look to it, almost like a factory custom. Compare this to the peppy and almost-preppy look to the bright colors that Honda motorcycles would be famous for. Not to mention the “You meet the nicest people on a Honda” ad campaign that would come out a little more than a decade after this Dream was made. This Dream 3E is a bit more sinister looking than the friendly-looking and bright-colored scooters that made the company famous. This Dream can hopefully be massaged into working condition and driven without messing with its originality. The seller says that “The pictures were taken at our shop in Japan. This bike is original, not restored.” It would be great if it could be kept in original condition other than what it takes to get it working perfectly again. In restored condition, these easily sell for $25,000+ but I’d rather have it in original condition. This one is really tempting, it would make a great addition to the Honda wing of Scotty G’s garage (wing = corner). The 3E has a 145 CC engine and a three-speed gearbox. This one turns over but the seller hasn’t tried to start it and the only thing missing is “the rubber boot from the carb to the airbox.” It even has a clear title which I didn’t expect to hear. Would you restore this bike or keep it as original as possible? This bike is pretty cool. These people are off their nut asking these prices for vintage bikes, but that aside, it really was an innovative bike for the early 50’s. OHV, multi disc, hand operated clutch, telescoping forks, I bet it could go the speed limit. 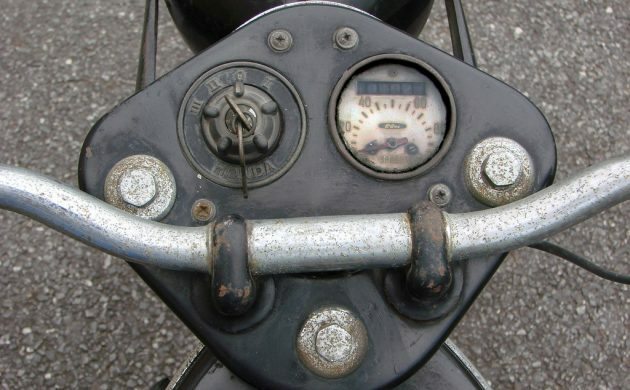 Always liked those backwards brake and clutch levers. No cable in the way, seems like a better way to do it. I’m a big fan of the “square” Dreams, but would like this just as well. $10g’s, you got to be kidding. Just like classic cars today, leaving the little guy behind. Being a mid century guy myself, birthwise, :) and liking old bikes generally, this certainly would be different at a any bike show. While I have always wanted a ’47 Indian Chief this would do in a pinch as it has a lot of the low slung design I like in older bikes. Interesting that it even exists coming a short 8 years after The War…. You are correct. The BMW R12 and several other models used pressed frames. I was thinking about the Nimbus myself. 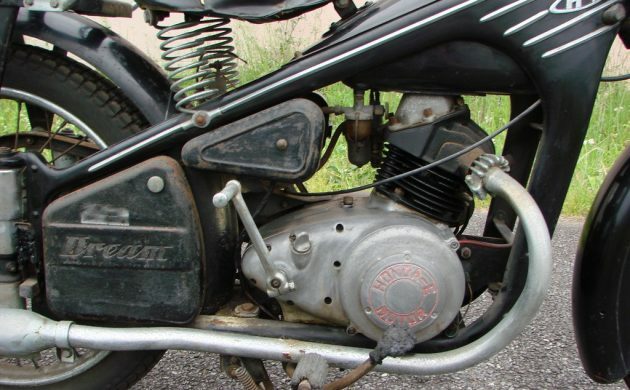 There were a few motorcycles built by others that used an external frame. OMG. This is one so unique. It’s a certified head turner, and parking lot conversation starter. I don’t think the price is out of control, true it’s hard to justify simply because it would be difficult to find another. It may be a decent investment, and I’d almost guarantee it will run. Can anyone identify the round silver can part on the left engine side at the base of the cylinder? Electric starter? Mag or coil????? 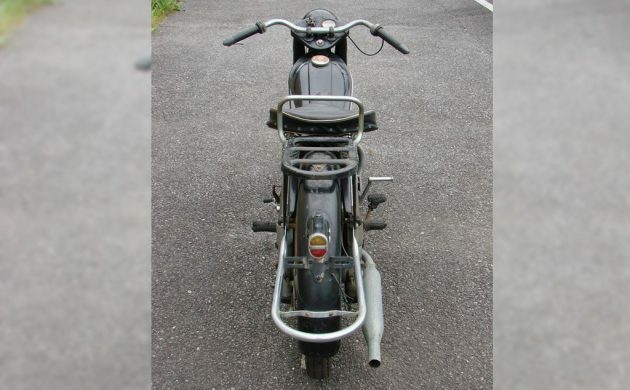 These early small bikes were not equipped with starters. Oil-filter. Electrics are in crankcase. Mint condition these fetch north of $20K, so this is a good deal for the right person. Heck, even as-is it’s a nice deal. I could park this in my living room and admire the lines and details every day just as much as I would admire a $10K painting. This would be welcome to attend any bike venue and draw a crowd. Especially Sturgis. Sturgis isn’t all about Harley, if it was it would be a failure! Believe me, I know first hand! Have a great day guys and of course gals! Our Dream E, Dream 4E and ME from years past. If one has a good contact in Japan, they are available – not really super-rare. Over a decade and a half or so I was able to import four Benly JC58s, a couple of JC56s, half a dozen Dream MEs, and two Dream 4Es. At one point a concern out west were reproducing the carb-to-filter boots for us, as well as grips in the proper odd green, and the footpeg, brake, and shifter rubbers. The can at the port side cylinder base is a cartridge type oil-filter. Got lots of information on the 1950s Hondas if anyone further interested . . . several of us in the US do, in fact. In your opinion what should this sell for. I love the look of this thing. A new updated replica, made by Honda, in say the160cc to 250cc range, would really sell. I just remember those later ones from the 60s. I think they were usually White and The Beach Boys wrote around on them. I’d rather have a Honda Cub… early sixties, 50cc… I used to have one when I lived in Vietnam. You really do meet the nicest people on a Honda… most of the a-hole’s I’ve met have tunnel vision and believe Harley is the only true bike. Wish I could still ride, but my brother died on his BMW going to work one morning, since then I have given up riding and working for anyone who expects me to be on time.